I have just returned from a family holiday in Queenstown. I enjoyed my five days in Queenstown at the 2014 RCSA Conference so much that I committed to return as soon as I could, with the family in tow. Amongst the many adventure pursuits of the trip (I still have a bruised backside from my attempts to navigate a snowboard) we dined at the many and varied eating options available. The standard of food and service was uniformly excellent throughout our stay. We ate at three of Trip Advisor’s top ten rated restaurants, including the #2 rated restaurant. Given that there are 205 places to eat (calling them all restaurants is stretching the truth just a little) in Queenstown that have been reviewed on Trip Advisor, making it to number two on the list is a mighty feat. By now I am sure you are a little intrigued as to what sort of gastronomic magnificence I encountered at this highly-rated establishment. I suspect you might be speculating about such features as knowledgeable and friendly staff, enticing entrees, a wide range of main courses, tempting desserts, comfortable and well-appointed seating, a lengthy and reasonably-priced wine list, warm ambience and value-for-money. Well, you’d be wrong on almost all of the above. There’s no entrees, no wide variety of main courses, no wine list, in fact there aren’t even any seats because no in-house dining is available. What, you say, how is that possible? There must be a trick. You see the #2 rated restaurant is called Pedro’s House of Lamb. Pedro’s House of Lamb has a menu that has a total of one item. Yes, you read that correctly, one item. 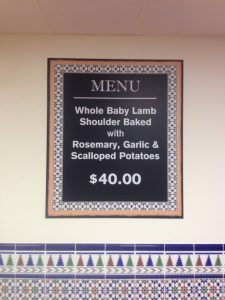 The only menu item is Whole Baby Lamb Shoulder Baked with Rosemary, Garlic and Scalloped Potatoes (NZD$40). Oh, and Pedro’s House of Lamb is also in Christchurch (but no home delivery available). Pedro’s is open 12noon until 9.30pm 7 days a week. And they are killing it. Just read Pedro’s House of Lamb Trip Advisor reviews. The lamb is slowly baked for four to five hours. Ours was delivered to our hotel 25 minutes after ordering it by a smiling Pedro’s employee and was absolutely delicious. Perfect after a day on the slopes or pursuing any of the many other activities available in Queenstown and the surrounding area. Pedro’s House of Lamb is a fascinating lesson in focus. Can you imagine the tsunami of ‘helpful’ advice Pedro must have received since he opened? Blah, blah, blah. All the well-meaning suggestions. All of which Pedro has ignored. Pedro knows that in the narrow niche market that is takeaway, Slow Cooked Lamb, in Queenstown (and Christchurch) he is the king. He knows that any competitor (none as far as I could tell) has a very daunting task on their hands to make any sort of dent into his market share. Why would they even try? What’s more simple, memorable or powerful than a high quality one-item menu? How much more of your existing market could you capture if you had a simple, memorable and powerful focus, rather than being distracted by all the ‘exciting opportunities’ you keep seeing, or being told about?